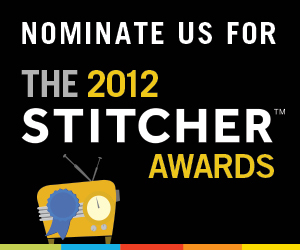 Another Nomination Request: Nominate us for the Stitcher Awards! A couple days ago I wrote about the 8th Annual Podcast Awards (you have voted for us, haven’t you? Haven’t you??!) Well now another company that we know and love has announced their first-ever podcast awards: the Stitcher Podcast Awards! We’ve written about Stitcher before, and we have been available on the Stitcher platform for quite some time now. Stitcher is an award-winning provider of news and talk radio for your mobile phone. They have a truly wide variety of programming available, from the media industry’s premier content providers — tech news, sports, talk radio, business, entertainment, and much more. (And yes, Otaku no Podcast as well) The app is free and is available for iOS, Android, BlackBerry and webOS (and probably a few others which I have forgotten). And they have decided to put on their own Podcast Awards! And it would be really awesome if you could vote for us! The difference here is, you are free to nominate us in whatever categories you choose. We recommend nominating us in the Film & TV and Entertainment & Pop Culture categories. (Of course you’re also welcome to nominate us for Overall Show too!) You can also vote once per day. Voting is easy and fast (probably will only take you a minute or so). Either click this link or the nice big Stitcher Awards graphic in this article (you can’t miss it). And, I’ve said it before and I’ll say it again, thanks for your votes; you are awesome! ChibiCast #0022 – Nominate us for the 2011 Podcast Awards! 1 comment to Another Nomination Request: Nominate us for the Stitcher Awards!